CEDAR CITY — With two rainstorms over a three-day span this week – and more rain in the forecast – officials are reminding Southern Utah residents to be aware of possible flash floods when making travel and recreation plans. Additional thunderstorms are forecast Thursday and throughout the weekend for Brian Head, Parowan, Cedar City and surrounding areas, according to Weather.com. The showers are most likely to hit in mid-afternoon, as is typical of Utah’s summer monsoon season. Parowan Police Chief Ken Carpenter advised motorists to check the latest weather updates and advisories before using state Route 143 between Parowan and Brian Head or to use an alternate route, such as state Route 14 up Cedar Canyon. 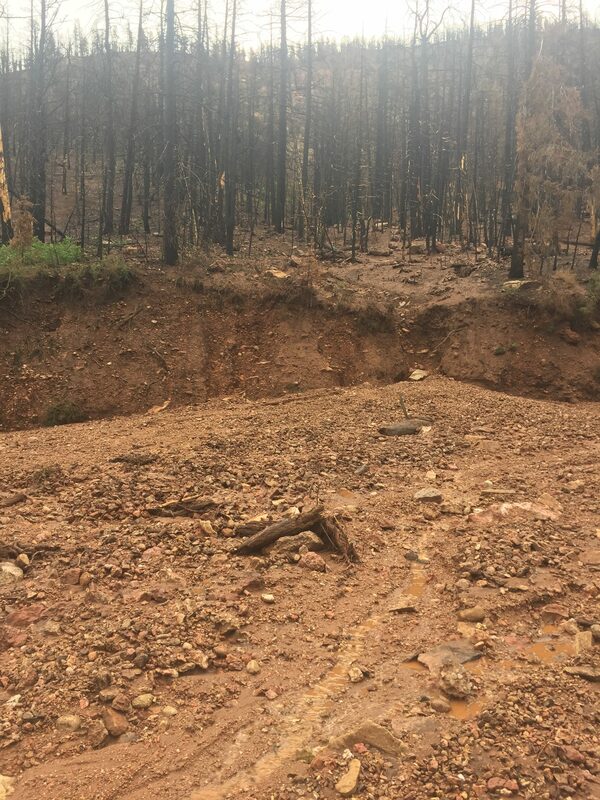 Several sections of forest along SR-143 in Parowan Canyon were burned in last year’s Brian Head fire, leaving the burn scar area susceptible to flash flooding during storms. SR-143 was completely blocked off for hours Monday afternoon as flood waters rushed down the canyon, pushing mud and rocks onto the road. No injuries were reported. Workers were able to use bulldozers and other heavy machinery to clear the debris from the road within a few hours. 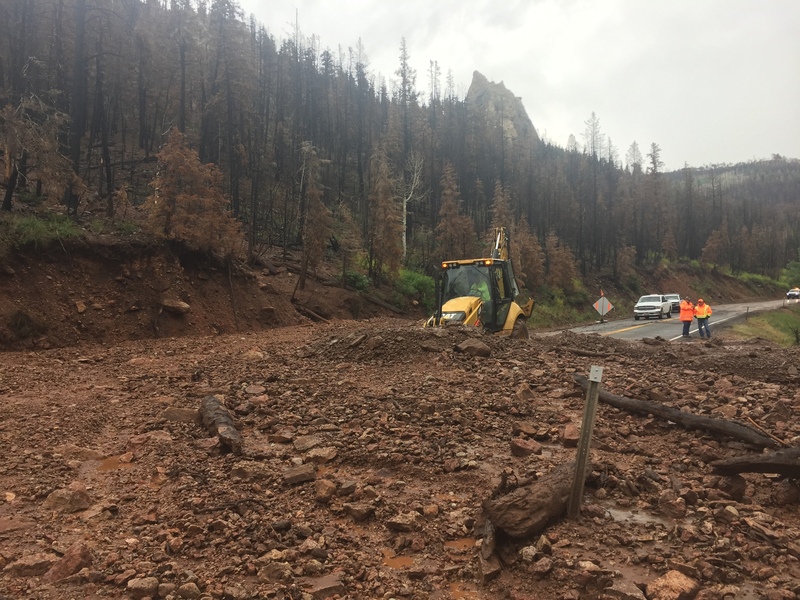 Monday’s storm dumped nearly an inch of rain on Brian Head in the space of an hour, according to Brian Head resident Mike Saemisch, who later posted drone footage of Parowan Canyon showing mud and debris washed over the road in more than a dozen places. 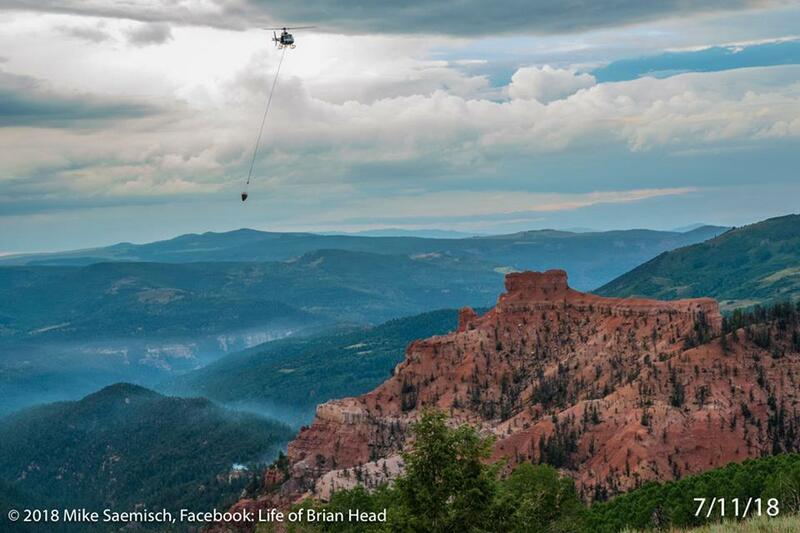 See video in media above, courtesy of Saemisch, via his Facebook page called Life of Brian Head, Utah. Another storm Wednesday brought approximately .30 inches of additional rain and some hail to Brian Head. While there were no reported flooding problems associated with that storm, lightning did apparently spark a small fire in the Ashdown Gorge area near Cedar Breaks. Crews worked from both ground and air to extinguish the blaze, reportedly limiting it to less than an acre. Despite the recent spate of moisture, severe fire restrictions remain in place throughout Southern Utah and many other parts of the state. Forest fuels remain dry, and can easily ignite. Whether in a vehicle or on foot, residents should remain alert for flooding even in locations not directly receiving rain. Dry washes, streams, and rivers can become raging killer currents in a matter of minutes, even from distant rainfall. If flooding is occurring or is imminent in the area where you are, it important to know where you are in relation to nearby streams, rivers or creeks that can become hazardous during heavy rains. During any flood emergency, stay tuned to official weather reports via radio, television, and social media. Cell phone users can also sign up to receive weather alerts as text messages. You can also follow St. George News and Cedar City News for weather alerts and updates relevant to Southern Utah. Ed. Note: While St. George News sincerely appreciates Mike Saemisch granting permission to use his amazing video, readers are asked to please remember that during fire season, drone use is prohibited near or over fires. Use of drones near a fire cause serious risk to firefighter and public safety. Unauthorized drones near a fire may ground aerial firefighting aircraft until the drone has left the area, inhibiting their ability to fight the fire. Mike does a great job on photos and drone videos of this area. I highly recommend following him on FB.